The WV-SFR611L 6-series Fixed Dome Network Camera is our new indoor vandal resistant camera with IK10(20J)(*)-rated impact resistance. It features HD 720p at 60fps and is equipped with a new powerful Panasonic UniPhier® System LSI with an enhanced codec engine, new MOS image sensor with Multi-processing Noise Reduction (MNR) and Intelligent Resolution Technology. This Fixed Dome Network Camera has improved image quality with 133dB wide Enhanced Super Dynamic, high sensitivity in low light conditions, IP-network friendliness and improved ease of installation and use. The WV-SFR611L camera is also equipped with a wide range built-in IR LED for obtaining clear images in the dark, as well as dual SD memory card slots for storing recordings locally. The WV-SFR611Lis ideal for discreet installations anywhere indoors. Panasonic's proprietary System LSI platform. IR LED is controlled to match the environment providing clear images of human faces without white blur. New camera attachment bracket allows for easy camera installation in all directions. High Speed ABF (Auto Back Focus) and Motorized Zoom ensures easy installation. Newly developed lens with aperture control function realises the best focus in any environment. VIQS (Variable Image Quality on Specified area) technology allows the designated eight areas to retain higher image quality while the excluded area will have a decreased image quality, which enables you to use a lower image file size and bit rate. Cropping function provides the whole image and the part image simultaneously. Up to 4 image capture areas can be specified with the possibility to control the sequence. Selectable light control modes: Outdoor scene, Indoor scene (50 Hz) / Indoor scene (60 Hz),Fix shutter; Indoor scene (50 Hz/60Hz): Flicker caused by fluorescent lightning will be automatically compensated. PEG Image compression ratio can be changed by alarm so that higher quality image can be provided. Prioritised stream control: One of the video streams can be prioritised when multiple recorders or client PCs are accessing the camera so that the recorder or the client PC can maintain the frame rate. Double SDXC/SDHC/SD Memory card slots for manual recording (H.264 / JPEG), alarm recording (H.264 / JPEG) and backup upon network failure (H.264 / JPEG). Realise long-term recording and auto backup function. Newly developed dome cover provides clearer images above the horizontal. Therefore expanding the tilting range of the lens. New intelligent extension software can be added to the built-in VMD (Video Motion Detection), alarm function. Super Chroma Compensation function realises a better colour reproducibility even in low illumination. Pan-tilt network camera HD 720p pan-tilt network camera. Panasonic has announced the availability of its new robust PTZ security camera, designed for the most severe weather conditions and mission critical applications. Welsh Government Minister Julie James has visited Panasonic Business’ European Service Centre in Cardiff which is celebrating its 10th anniversary. Panasonic has introduced a new network camera range at Security Essen 2016, combining Full HD resolution with the company’s latest software, capable of reducing storage and network bandwidth by as much as 80 per cent beyond H.265. Panasonic security products have received four nominations at the 2016 Security & Fire Excellence Awards, held in London. Panasonic Business is developing drone finding technology that can help mitigate the threat of drone accidents and terrorism. 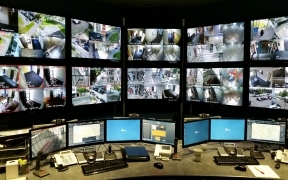 Panasonic Business will use IFSEC 2016 to introduce some of the company’s smart technologies that reduce the overall cost of security systems, and will ask the industry to reconsider how CCTV is procured. 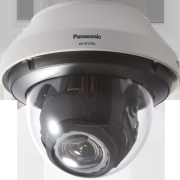 Panasonic Business will introduce the industry’s most robust PTZ security camera, designed for the most severe weather conditions and mission critical applications, at IFSEC 2016. Panasonic on Monday 11th May launched a 4K surveillance camera, at an industry event at The Tower of London, which the company says will deliver greater coverage at a lower cost. Walsall Housing Group (whg) has improved resident safety with the installation of 380 Panasonic surveillance cameras that cover 17 high rise blocks.